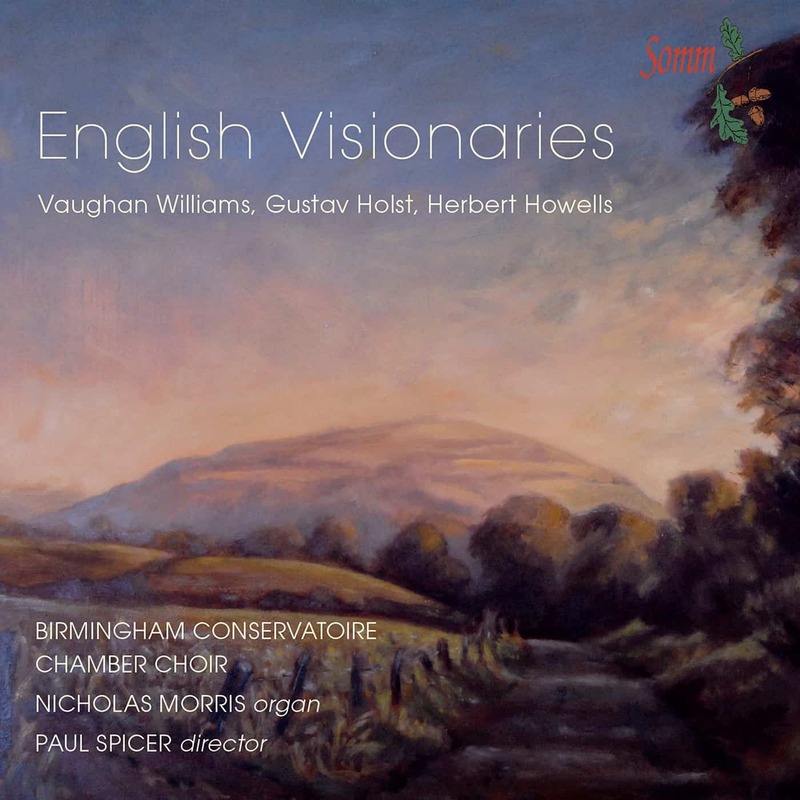 SOMM’s new release, English Visionaries, adds yet another delightful CD to its catalogue of English choral music, the fifth disc in the label’s successful collaboration with the Birmingham Conservatoire Chamber Choir and Paul Spicer. Their disc of Ireland and Delius Partsongs (SOMMCD 0119) has garnered 5-star reviews whilst their disc of Stanford Partsongs (SOMMCD 0128) was chosen as 13th out of 24 discs considered the best new releases of 2013 on Classic FM. Their disc of rare repertoire by Herbert Howells (SOMMCD 0140) was Editor’s Choice in Gramophone (December 2014) and received 5 stars in Choir and Organ Magazine. The repertoire chosen by Paul Spicer for this recording dispels the thought that the music of Vaughan Williams, Holst, and Howells is ‘English’ in a derogatory sense, recalling more Elisabeth Lutyen’s ‘cowpat school’ label rather than that of ‘visionary’. As is amply demonstrated on this disc, all three were composers of enormous transcendent vision, forging a uniquely English musical revolution. One need only hear the soaring lines of Howells’ The House of the Mind to recall the rarefied ecstasy of his better known Hymnus Paradisi. The inexorable build of Vaughan Williams’s Lord, Thou Hast Been our Refuge scales similar heights, as does the other-worldly harmonic and contrapuntal landscape of Holst’s the Evening Watch and Sing Me the Men. 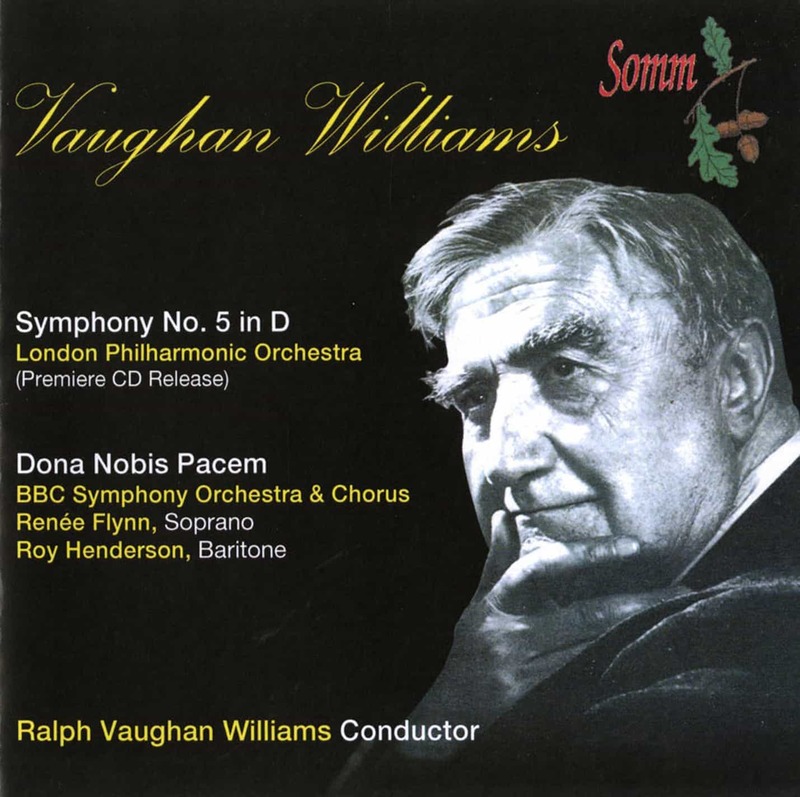 Vaughan Williams’s status as a revolutionary is strongly evident in his Mass in G Minor, a sublimation of late renaissance music into something powerfully new. He dedicated this inspired work to his friend Gustav Holst in 1921. His post-war (1956), technically virtuosic A Vision of Aeroplanes provides an enormous challenge to the performers, and a marked contrast to the warmth of Prayer to the Father of Heaven with which it opens the disc. Their first CD called To Music was an Anthology of English 20th century choral music and was CD Review Recording of the month (MusicWeb International) and the review commented. “…This is one of the finest discs to have come my way in some time”. Their disc of music by Ireland and Delius partsongs on SOMM was also awarded 5-star reviews and their recording of the first ever disc to be devoted to Stanford’s partsongs (also on SOMM), was chosen as 13th out of 24 discs considered the best releases of 2013 on Classic FM. 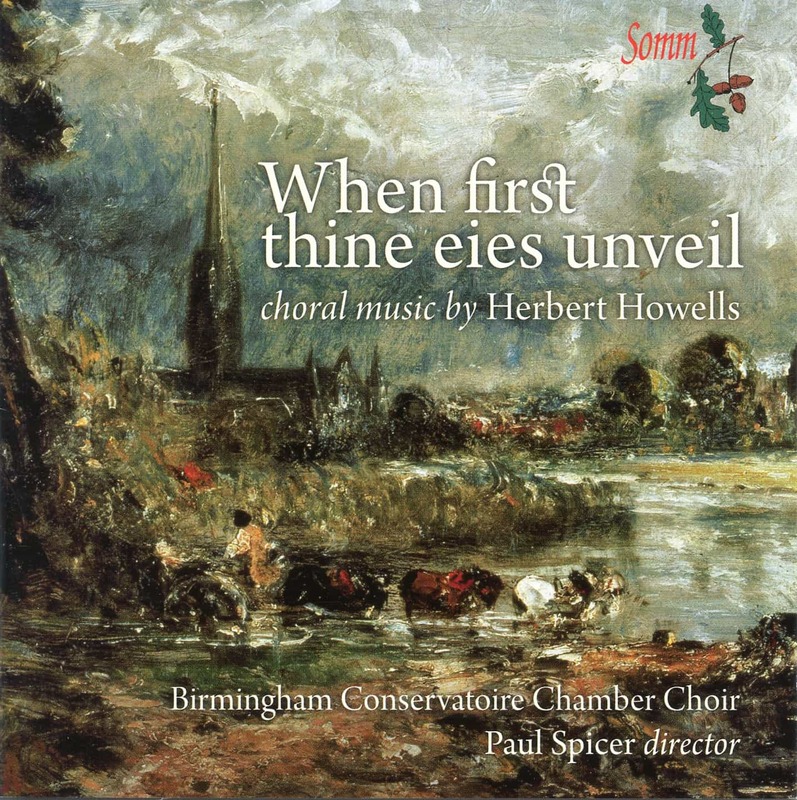 The Observer commented that the music was dressed in the richly jewelled sound of the Birmingham Conservatoire Chamber Choir and that ‘many a choir could learn from these singers.’ Their SOMM disc When first thine eies unveil by Herbert Howells was chosen as Editor’s choice in Gramophone in December 2014 and received 5 stars again in Choir and Organ. Paul Spicer was a chorister at New College, Oxford. He studied with Herbert Howells and Richard Popplewell (organ) at the Royal College of Music. Paul is best known as a choral conductor, partly through the many CDs he made with the Finzi Singers. 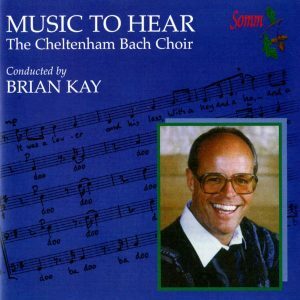 He conducted Bach Choirs in Chester and Leicester before moving to conduct the Bach Choir in Birmingham in 1992. He taught at the Royal College of Music in London between 1995 and 2008. He now teaches choral conducting at the Birmingham Conservatoire, where he also directs the chamber choir which has an increasing reputation through its regular recordings of British music, and at Oxford and Durham Universities. Paul Spicer’s highly-acclaimed biography of his composition teacher, Herbert Howells, published in 1998, has been reprinted twice and his large-scale biography of Sir George Dyson was published in 2014 and he is now writing a biography of Sir Arthur Bliss. He was commissioned by the Britten-Pears Foundation and Boosey & Hawkes to write the first practical guide to all Benjamin Britten’s choral music for the Britten centenary in 2013, something he continues to do for all James McMillan’s growing choral output. As a composer his Easter Oratorio was hailed as ‘the best of its kind to have appeared.. since Howell’s Hymnus Paradisi. It was also chosen as an Editor’s Choice in the same magazine. His choral symphony Unfinished Remembering to a text by Euan Tait commemorating the centenary of the First World War was premiered in Symphony Hall, Birmingham in September 2014. Nicholas Morris spent his early musical years as a chorister at Westminster Abbey under the direction of James O’Donnell. He was subsequently a Music and Academic Scholar at Uppingham School. Between 2011 and 2014, Nicholas held the Organ Scholarship at Queen’s College, Cambridge, where he also read for a degree in music. After graduation, he moved to the West Midlands and took up the post of Assistant Organist at Birmingham Cathedral. In September 2016, he joined the Choir of Clare College, Cambridge as Assistant Organist, acting as principal accompanist. Nicholas has performed extensively as a soloist both in the UK and abroad. International engagements have included performances in Norway, the United States and in the opening concert of the 2012 of Münster Orgelsommer. UK recital venues have included St. Paul’s Westminster, and Southwark Cathedrals in London, the Cathedrals in Wells, Ely and Truro and Wesminster Abbey.